This tutorial will show you a method for remove a single brick, or a portion of a brick while leaving surrounding bricks intact. This may be required when a single brick is damaged or stained, or when a portion of a brick needs to be removed in order to install mechanicals, such running an electrical outlet or plumbing pipe. Or you may wish to refurbish your fireplace. 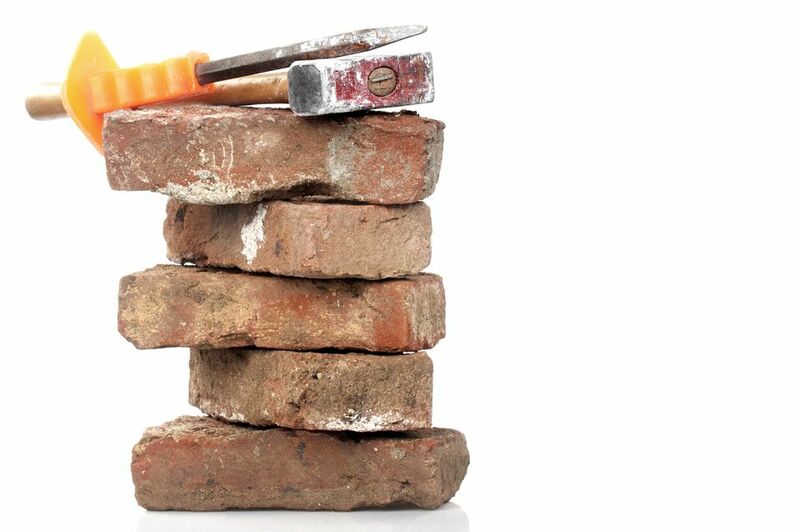 There are several methods of cutting out a brick for removal. You can put a masonry blade on your circular saw, for example, or use an angle grinder. Or, a reciprocating saw with a masonry cutting blade can also do the trick. You can even use a high-quality multi-tool equipped with a masonry attachment. And this is only the beginning of the list. The job gets a little more complicated, though, if you want to remove a portion of a brick. When removing a complete brick, it's just a matter of removing the surrounding mortar to free the brick, but when removing part of a brick, you must remove the mortar plus sever the brick in a clean line, all without making the brick crumble into little pieces. Our method is slow, but it works. It's great when you just need to remove one or two bricks and partial bricks. Note: Make sure to use a genuine masonry chisel for this operation. Neither a wood chisel nor a cold chisel (designed for metal) is appropriate for this job. Using either runs the risk of shattering the tool and potentially sending metal fragments flying. A masonry chisel can be identified because it will have a serrated cutting edge, rather than the smooth edge seen on a cold chisel. Have you ever seen a close-up of a large sculpture like Mt. Rushmore? You will see the remnants of holes drilled into the rock. To remove large sections, workers would drill a series of holes to outline a cutting plane, then small explosive charges were used to sever the rock along the line of holes. This method works much the same way, though rather than explosive charges it will simply be hammer and chisel blows that break the brick along the line of drilled holes. Begin by drawing a line where you want to cut the brick. Next, draw another line about 1/4" next to it on the side where you will be removing brick. You will be drilling into this second line, preserving the first line as a reference. Drill a series of holes along this second line, spaced no more than 1/4" apart. Unless you are fortunate enough to own a hammer drill, you will need to push pretty hard on the drill and even wiggle it around just a bit. Excessive pressure, though, can quickly dull your masonry bit, so the trick is to take your time on this operation. Bricks do not like holes drilled into them, so you will need to work at this. Do not wiggle the drill too much or you will break the end of the bit. Now you've got a series of holes. Ideally, the holes will have penetrated through the entire thickness of the brick. But you can still complete the removal even if you can only drill 1/2" or 1" at a time. With your masonry chisel and hammer, lightly break out those dividers between the holes. Slightly angle the chisel toward the waste brick (the portion of the brick to be removed) so that you do not risk damaging the portion of the brick that will remain. In the example shown here, we were able to drill holes all the way through the brick. Thus, the cut was clean, easy and posed little risk of damaging the remaining brick. Just because you have chiseled through doesn't mean the brick will come out easily. You'll still have remaining mortar along the back face holding the brick. Be patient and lightly chip away or use your chisel as a level to pry the brick. A small pry bar can also be a good tool for this. With all the obstructions gone, you should be able to remove the brick by hand. A bit of wiggling may be necessary. Use your chisel to smooth out the rough edges of the brick to an acceptable point. After about ten minutes of careful chipping, you should have reasonably clean sides to work with. It also helps to use a wire brush.